If you are a user from a Wixie-using district, after this update you will see a list of schools when when you launch Wixie. Choose your school from the list. You will see a list of teachers in the school. If you are a user from a Wixie-using school, you will go directly to this screen. If you are a teacher, tap the Staff Login link for your user to display a field to enter and submit your password. If you are a student, tap your teacher to see a list of that teacher’s classes. Select your specific class. Tap your name. Enter your password in the field that appears and tap the Log In button. After you have logged in once using this method, a cookie will be set on the device to remember the school for this user. 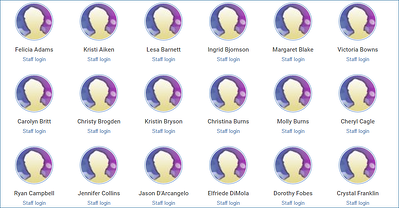 The next time you try to log in to Wixie you will be taken directly to the list of teachers at your school. If you are launching the Wixie app for the first time on a tablet, you will need to search for your school or teacher. You only need to complete this process one time. A cookie will be set on the device so that future launches of the Wixie app will take you directly to your school. We recommend customizing profile images for teachers and students to make it easier for users to identify themselves and easier for students to identify their teachers. Students can paint a picture in Wixie to use as their profile image. Teachers can use an existing library to select an image, like a butterfly or soccer ball, for their students. create a picture in Wixie.